I recently decided to become more involved in automobile racing, something which has been a passion of mine for many years. In addition to covering the automotive industry as a freelance writer, I have also had the chance to enjoy autocross, drag racing, ice racing and rallying. This spring, it became clear that my daily driver, an older BMW sedan, was no longer appropriate for track use. I did not want to risk either wrecking the vehicle or wearing it out prematurely, as I very much enjoy driving it on the street. I decided to take the plunge and purchase a dedicated track car, one which would be intended for the abuse and risks of the race track, and one which was far more suited for competitive driving. My primary driving activities this summer will be autocross and high performance driving event / education related. I won’t be trading paint with anyone in a competitive series, but I will be pushing myself to my own limits as a driver and trying to improve my abilities. The old adage about ‘tightening the loose nut behind the wheel’ is where I will be focusing my time and attention. To this end, I wanted to select a car which would be light enough for the track, well balanced and rear-wheel drive. I also didn’t want to invest too much money in the vehicle, in order to save unnecessary heartache should the unthinkable occur and I end up writing the car off during an on-track mishap. Finally, I didn’t want something that was too powerful. It’s far more rewarding to learn how to drive something that doesn’t have enough horsepower to hide a lack of talent or skill. With a slower car, improvements in lap times must be made through smooth driving and carried momentum, not powerslides or straightaway rushes. I decided that a first-generation Mazda Miata would be my best bet. Miatas have a huge community of racers, fans and aftermarket suppliers that ensures enough of a knowledge base for me to repair it or modify it myself without too much trouble. The cars are simple, common and inexpensive when it comes to sourcing parts. They also have a great reputation for reliability, which is important when pushing a car hard at the track. I also had a craving for a convertible. 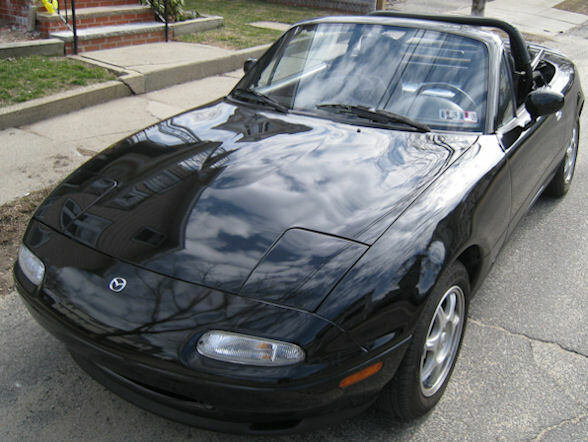 After months of searching, I happened upon an excellent 1995 Mazda Miata R package in Pennsylvania, just north of Philadelphia. My father and I made our way down to pick it up and weren’t disappointed when we actually encountered the car in person. It was exactly as it had been described by the seller, and it matched his pictures to a T.
After getting it home and parking it in the garage, the process of making it race-ready began. 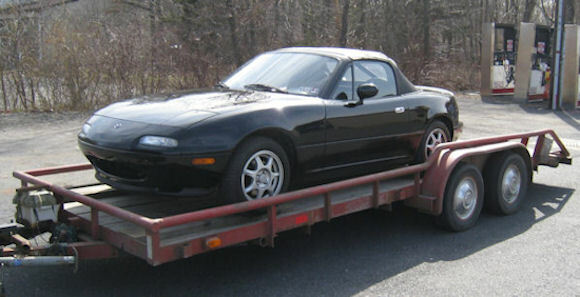 I will be chronicling my journey into the world of affordable, Miata-based racing over the next few months. The next installment will describe the efforts I have had to make in order to keep my car mostly stock, yet still pass safety and technical inspection at the tracks I intend to run. Does anyone else here write about cars, or also compete in autocross or time trials? Michael – you are right, it is time for an update about what has happened with the car over the past year or so. I do have a post about keeping things stock this month, which indicates my philosophy in terms of the car’s immediate future. You might want to check that out in the meantime. If you are on the fence about picking up a Miata as a track car, I would say do it – the vehicle is an amazing learning tool, and it is honestly the most fun to drive car I own, despite having one quarter the horsepower of my daily driver.